Q – Susannah B. of Westport, Connecticut asks: We are looking for a full service resort in Cabo San Lucas on Mexico's Baja Peninsula for my family of 5 over the Christmas holidays.Q – Susannah B. of Westport, Connecticut asks: We are looking for a full service resort in Cabo San Lucas on Mexico's Baja Peninsula for my family of 5 over the Christmas holidays. A – Take a look at our story entitled "Hilton Los Cabos Beach & Golf Resort" – we highly recommend it. It's located on the calm Sea of Cortez and offers two fantastic zero-edge pools as well as a swim-able beach. (This is actually unusual along the rocky Baja coastline, where the seas can get very choppy and there is often too much undertow for safe swimming.) This resort also has a myriad of activities, a spa, and free childcare with a supervised, organized daily program. 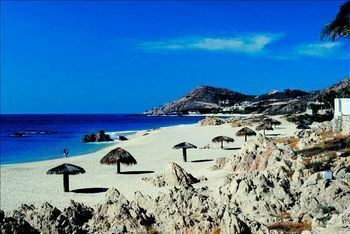 The Presidente InterContinental Los Cabos also comes recommended. We've reviewed their wonderful Cozumel property, and this resort also has a seasonal All-Inclusive Package that includes a deluxe oceanview room, complete with an inside living area or a private balcony; gourmet breakfast, lunch, dinner, and snacks (they're known for especially good food); 24-hour room service; unlimited beverages and imported alcohol; an activities program featuring yoga, Pilates, tennis, golf, water sports, and can you believe it complimentary massage. Families with younger children will especially appreciate the three heated pools (including a kiddie pool) and the highly-regarded Chiqui Club for ages 5-12. With this package, the resort offers a free tour of the famous arch of San Lucas, reduced rates at the Nicklaus-designed Palmilla Golf Course, and a Hop on-Hop Off Bus Tour for two of Los Cabos. Check out www.intercontinental.com for reservations and information.